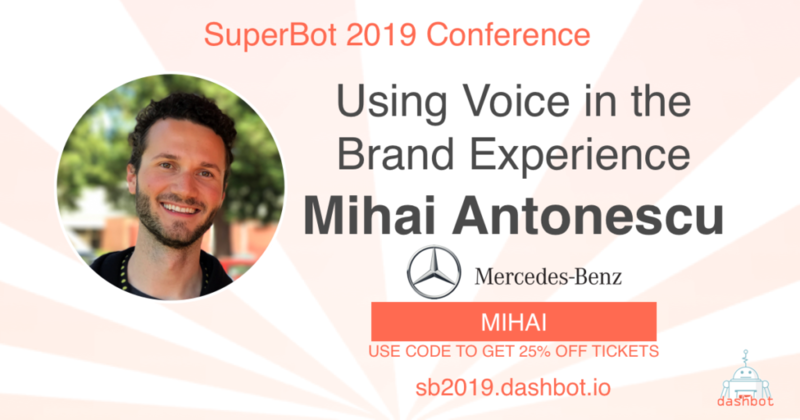 Senior Software Engineer Mihai Antonescu for Mercedes-Benz’s Speech and Digital Assistant team will be attending SuperBot this year to share his insights on developing a voice assistant for a big brand. Mihai Antonescu is a Senior Software Engineer on the Speech & Digital Assistant team at the Mercedes-Benz R&D office in Silicon Valley. He is responsible for leading and creating intelligent features for the #HeyMercedes voice assistant within Mercedes-Benz vehicles. Mihai believes in a future where connectivity between devices and artificial intelligence will create a seamless environment that improves everyday life. Inspired by exploration and discovery, he seeks innovation and is always on the lookout for the next challenge.